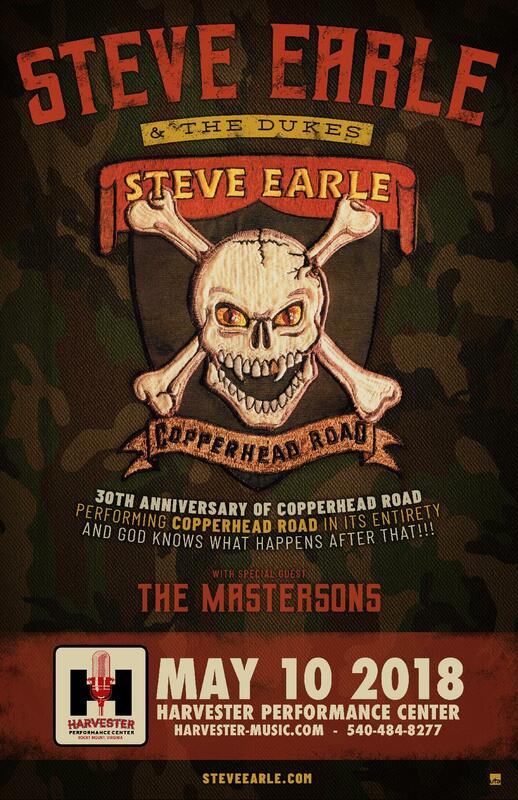 Three-time Grammy Award recipient and 11-time Grammy nominee Steve Earle is a cornerstone artist of Americana music. One of the most acclaimed singer-songwriters of his generation, he has released twenty albums – a number of them were as Steve Earle and the Dukes, one was Colvin and Earle, another was Steve Earle and the Del McCoury Band, etc. Earle’s songs have been recorded by such music legends as Johnny Cash, Emmylou Harris, Carl Perkins, Waylon Jennings, Vince Gill and Joan Baez. He has created such country successes as “When You Fall in Love,” “Guitar Town,” “Goodbye’s All We’ve Got Left,” “A Far Cry From You”and “Nowhere Road.” During his four-decade career, Earle has also become a novelist, a film, TV and stage actor, a playwright, a short story author, a record producer and a radio host. He is a longtime activist whose causes have included the abolition of the death penalty and the removal of the confederate flag. Always musically adventurous, Steve Earle has crafted folk, blues, rock, country, rockabilly and bluegrass recordings. His diverse collaborators on disc have included such notables as The Pogues, Lucinda Williams, Patti Smith, The Fairfield Four, The Indigo Girls, Chris Hillman, Sheryl Crow and Shawn Colvin. His new Warner Bros. Records album, So You Wannabe an Outlaw, explores his country songwriting roots and includes collaborations with Willie Nelson, Johnny Bush and Miranda Lambert.